Apple, Inc. AAPL – AAPL beat on earnings as well as kicking off sales on the iPhone X, and two out of three of the AAPL Weekly $170-175 Calls* we signaled for possible daytrades ended up recording some nice moves on the day. Our first order of business to kick off the fresh week is to recap those moves followed by another set of winners we chose on Friday. Arista Networks, Inc. ANET - The set of ideas we formulated for ANET on Friday were the 11/17 $195-210 Calls, and all three sets of contracts in that range provided traders with the chance at multi-bag intraday gains. For a new potential play, we’re looking at Pandora Media, Inc. P which took a gut punch on Friday, falling to its lowest prices since early this summer. The last time the stock was this oversold, it followed it up with a run from 6.75 to to 10.00. We’re going to go out a couple of months on the expiration and track the P 01/19 $6 and $7 Calls so we have plenty of time to see Pandora make the rebound we’re after. 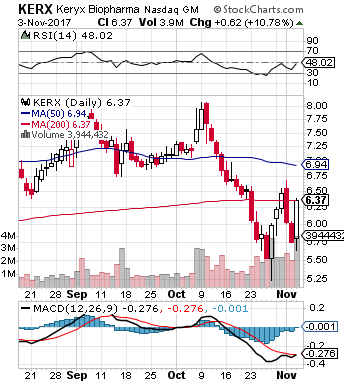 We’re going to put KERX on watch after noticing multiple ripe indicators this morning. The stock bounced of a recent bottom and close with strength at the 200DMA on Friday. With the MACD gearing up for a bullish cross and the RSI just about to crack the 50-line, we’ll be interested to track the activity in KERX in coming sessions.